The original, natural environment of 800-year-old Huanggang village, in the Qiandongnan Miao and Dong autonomous prefecture of Guizhou province, entranced Xu Zhengxue when she visited for the first time early this year. The village, inhabited by the Dong ethnic group, is being slowly opened up for tourism and is preparing a submission for recognition as a World Heritage site in 2021. The wooden cabins in the village are still constructed the old way, without bricks or nails, and the Grand Song of the Dong, which was recognized by UNESCO in 2009 as part of the Intangible Cultural Heritage of Humanity, resounds in the air. When Xu, who used to work as an intern for UNESCO, learned the village was preparing a World Heritage site submission, she decided to help. Just a few weeks after going back to her hometown in the Yanbian Korean autonomous prefecture, Jilin province, the 28-year-old returned to Huanggang when others were still enjoying their Spring Festival holiday. Xu worked for a year as an intern at the UNESCO Office for Latin America and the Caribbean in Montevideo, Uruguay, after finishing her master's degree at Jilin University in Changchun, the provincial capital, in 2016. There were about 30 employees from all over the world at the office, she said. She was the only one from Asia. "During office gatherings, I often presented the Korean ethnic culture, such as the costumes, food and wine," she said. "Even though I am Han Chinese, I'm familiar with the Korean ethnic culture because there are so many ethnic Korean people around me. I found my colleagues were interested in such ordinary things in my daily life. "They began to make plans to travel in China, but they didn't know much about the country except for the Great Wall. Then I told them there are so many charming and recommendable places in my motherland." However, she was sometimes stumped when her colleagues asked her questions about China. "I found that I didn't know much about my country, especially ethnic cultures," she said. "Therefore, after finishing the year of intern work, I decided to go around China, trying to get to know more about it." 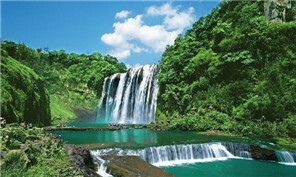 She spent about a month traveling in the provinces of Shandong, Hebei, Hunan and Guizhou. At the Guizhou Museum, Xu said she was fascinated by the cultural richness of the ethnic groups. Introduced by a local friend, she chose Huanggang village to experience the Dong way of life. "Unlike the tourist attractions I saw, the undeveloped village provided me with a quiet world, and I believed the Grand Song was the most beautiful melody I'd ever heard," Xu said. After returning to the village, she began collecting information to bolster its submission for a World Heritage listing. "Before starting the work, I thought it wouldn't take me a lot of time because the culture in the village was abundant and well-preserved," she said. "But when I started, I found it a difficult task due to the lack of written materials. "The Grand Song, for example, is handed down through word-of-mouth from generation to generation because the Dong language has no written form. However, there are fewer young people willing to learn how to sing in the traditional way from an early age." Xu said performances and competitions for Dong choirs have traditionally been arranged for festivals or to welcome honored guests. "These occasions are also a good chance for young men and women to get to know each other, and they may fall in love through singing activities," she said. Dong choirs are made up of multiple people singing different harmonies and require no conductor or musical accompaniment. Choirs require at least three singers; the more singers, the better the effect. The imitation of natural sounds, such as the chirps and tweets of birds and the sound of flowing water are an integral part of Dong songs, reflecting their close association with nature. "Most of the Dong singers from the village choose to earn money by performing in other tourist areas in Guizhou and the nearby Guangxi Zhuang autonomous region," Xu said. "The old people and children are left behind." Soon after she arrived, Xu set up an extracurricular class so village children could learn about environmental protection, health and painting, and she also invited an experienced Dong singer to teach them the Grand Song. "After several months' training, some children's performances were outstanding," she said. In order to get more help and let more people know about the Dong culture, she took two children to Jilin University to join in the award ceremony for excellent graduate students at her alma mater in July. The song by the children, dressed in traditional clothing made of hand-dyed cloth, complete with elaborate silver headwear and necklaces, won warm applause. 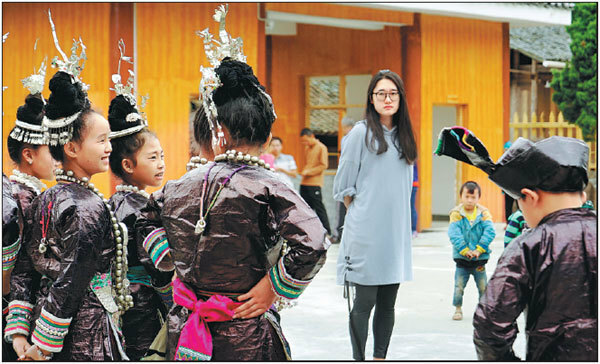 "The memorable experience made the children more clearly recognize the greatness of their ethnic culture and strengthened their sense of mission to inherit it," Xu said. She said Jilin University had helped her collect about 34,000 yuan ($5,000) for a Dong choir made up of young villagers. A medical team and supporting education team also arrived at the village in the summer, providing the villagers with great help in health services and their children's study, she said. Seventeen young singers who had left the village have returned and joined the choir. "After visiting almost all the families in the village, I found most of the migrant workers were concerned about their families, especially their young children," she said. "Therefore, I began to persuade them to come back to the village and set up their own Grand Song choir." Xu has also tried to find the choir more opportunities to perform near the village. "At the beginning, there were only three members, but we still persevered," she said. "Now more young villagers have chosen to return to their hometown." Wu Chenglong, 41, an inheritor of the Grand Song tradition, quit a job at the Liping county cultural center, in the same prefecture, to return to the village as the choir's instructor in July. "In recent years, I've taught lots of students and participated in different performances outside," he said. "I felt it was a bit of a pity that I didn't personally contribute to my village." As a result, when he got the news that the choir had been set up, he decided to return. "I am also deeply moved by this young woman (Xu) who has such great power," he said. "There is no reason for me to refuse to strive for the Dong culture." Xu said, "As a nonnative, I can only try my best to provide support to the villagers. The heavy responsibility of cultural inheritance will ultimately fell upon them. I believe they can bear it successfully."